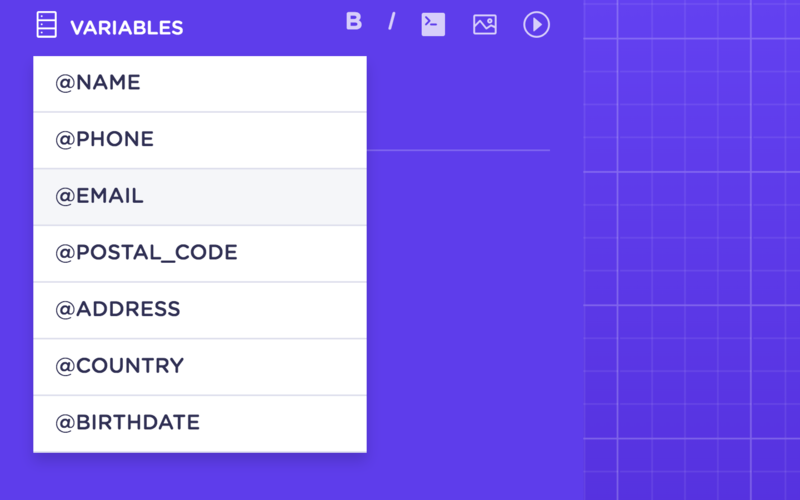 Variables: use them to dynamically add already collected data from your users to your messages. E.g. : "How are you today, @name?" will display the visitor's name at the end. Click on Variables to open a drop-down of the fields available, but make sure you don't add a dynamic field you don't know yet or it will not show! 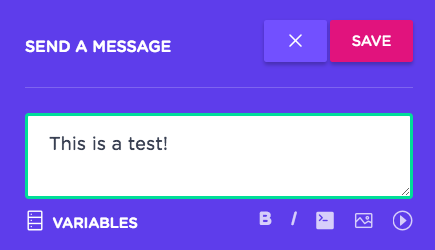 Bold: When clicked, it will create two asterisks (*) for you. Put them before and after every word(s) you want to bold. E.g. : "*Bold text*" will be displayed "Bold text". Italic: When clicked, it will create two low bars (_). Put them before and after every word(s) you want to make italic. E.g. : "_Italic text_" will be displayed "Italic text". HTML: When clicked, it will create two HTML tags (<html> and </html>). Put them before and after the piece of HTML code you want to execute to make sure it works but won't be displayed as regular text. Image: Click on the fourth icon to add an image. You can browse any JPG, PNG or GIF file! YouTube: Add a YouTube's URL to natively embed a video inside a message block.